Today’s drink of the day is the plain and simple Bourbon Cocktail — in all of its forms. Actually, the drink may not be so simple, at least when you try to order it in any but the old-fashioned form. The better part of a decade ago, my wife was able to get the Bourbon Cocktail (‘soft’ and ‘up’) at a well-known, whiskey-focused bar in downtown Los Angeles. She likes whiskey and has always loved that classic drink. A couple of years and staff incarnations later, she was there again. It was a little past seven o’clock and she thought it would be grand to have a Bourbon Cocktail. The bartenders at that supposedly old-tradition bar had no idea what she was talking about. She was passed between bartenders and finally to the manager. When she explained it to them slowly, and with greater politeness than I would have been able to muster, they thought that she was telling them to stir and strain ‘the Old-fashion’ (as if that were a specific drink, rather than the old way to make a cocktail out of any liquor). They let her know that they (mis)took her to be asking them to violate something classic and hallowed, and they refused. Such ignorance from those who wrap themselves in the pretense of American mixological tradition can be breath-taking. Here are some recipes from 1895 that illustrate the point. They are for the various forms of the Brandy Cocktail, but the source gives all three, likewise, for the Whiskey Cocktails. So, you’ve just got to do it for yourself, it seems. If I want to sip it a while, I have it the old-fashioned way. If I am going to drink it in the traditional three-or-four gulps, I have it ‘soft’ and ‘up.’ Drinks of this type used to be called ‘soft’ because they were already fully-diluted when served — in a goblet (‘up’) without ice. If it is cold outside, I have it hot. All are very pleasing in their way at various moments. 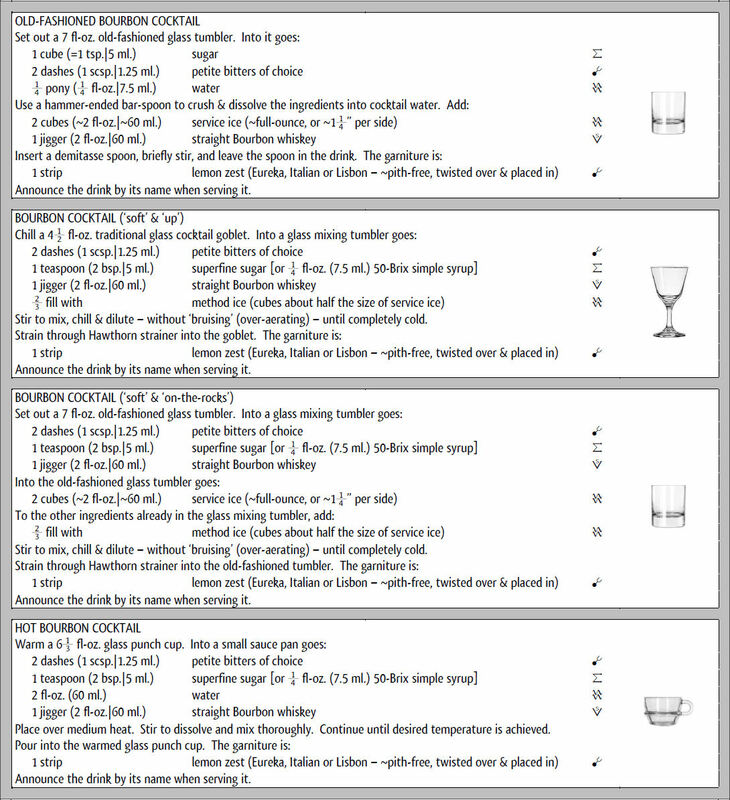 That said, I almost never have it ‘soft’ and ‘on-the-rocks.’ Here are the recipes. Thank you. Your comment gave me a chuckle! It’s interesting how differing conventions of terminology can throw one for a loop. I’ve been in this cocktail thing since 1995 or so and “soft” is new to me, although with a little context, I totally get it. For that matter, I’ve never referred to the drink in question as the “Bourbon Cocktail”—rather, I know it as the “Whiskey Cocktail”, although “Bourbon Cocktail” is obvious to me, and obviously less ambiguous. I read the word ‘soft’ in the descriptive part of a drink’s name in George Kappeler’s, and others’, books many times before I realized that it was always a term used in connection with the stirred-and-strained version of a drink that might otherwise be served less-diluted, having being ‘built’ and served ‘on-the-rocks.’ The old tradition died as a result of prohibition (and other things), and those of us that want to understand it have only the written tip of the iceberg of that once-living tradition. I have often discovered that my post-prohibition assumptions were keeping me from fully understanding what I was reading in the old books. Undoubtedly, there is still much old text before my eyes that my modern experience keeps me from fully grasping. When I read your comment just now, I was in the act of composing an article dealing with this exact issue. It should be finished and posted today. I hope that you will find it interesting. About the whiskey… It was only called “Whiskey Cocktail” in pre-prohibition sources. In those days the whiskey was usually rye. After prohibition it switched to Bourbon whiskey. I find them to be different drinks, so I divide them.